At some species of spicy herbs, such as parsley, shnitt-onions and sage, leaves and young escapes it is possible to collect during the whole year. At others for this purpose the spring (two-and perennial pryanoarollatichesky plants) or fall (one-year cultures) approaches more. Anyway with collecting leaves it is necessary to wait until plants well do not grow up. The first cut off older and large leaves. Since the fall gathering greens of long-term pryanoaromatichesky cultures is not made. Practically all species of spicy herbs can be used fresh right after collecting. If you want to keep greens of pryanoaromatichesky herbs, then shortly before the beginning of blossoming in dry weather stalks cut off at the basis of plants a sharp knife or secateurs. Basic rule is as follows: the more accurately collecting is made, the more aromatic oils will remain in greens spicy a plant. The cracked or broken off leaves lose a considerable part of the aroma. Weigh harvested some greens of pryanoaromatichesky herbs it is necessary to dry up quickly and carefully. Well aired attic or a case with a mesh bottom perfectly is suitable for drying, for example. Anyway this place has to be dark. The best temperature of drying — about 30 °C. Depending on plant species various technology of drying is used. Large leaves as at a basil or a sage, display a thin layer on the racks, metal gauzes tightened a gauze frames or other devices. Spicy herbs with small leaflets, such as tarragon or fennel, connect in bunches together with stalks, turn in paper and suspend. Aromatic plants at which fruits (seeds) are used for example an anise or a coriander, connect in small snopik and thresh them after drying on a baking sheet with high sides or in a box. Time of drying of spicy herbs — from 2 to 7 days: it depends on plants and on temperature. When leaves begin to rustle or fall down, and stalks cannot be bent as they easily break, spicy greens mean dried. Later, the ends of drying leaves without stalks can be pounded in powder between palms. At those pryanoaromatichesky plants which drying was made together with stalks at first tear off leaves which also pound in powder. The dried-up and processed spicy herbs can be stored in opaque glass jars with skintight covers, wooden tuyeska or cans. If at your disposal there are only transparent banks from white glass, then they can be wrapped up aluminum foil. On banks it is necessary to paste labels with names of plants and date of a bookmark on storage. The dried-up spicy herbs which intend for some special use for example as a component so-called "a garna beech" (bouquetgarni), it is not necessary to pound in powder, certainly. In this case it is the best of all to dry up greens together with small pieces of stalks and to store it in such look. The same treats also the spicy herbs intended for addition in vinegar or vegetable oils. In the course of drying some species of pryanoaromatichesky plants are lost by a part of the aroma, for example parsley, and some, such as fennel, completely it is kept. Spicy herbs can be frozen also with success. At the same time it is necessary to pay attention to that leaves were whenever possible not crumpled and not crushed. For this purpose leaves of pryanoaromatichesky plants or small bunches from them stack in strong plastic banks. Fennel, a tarragon, a basil, a chaber, a chervil, a lyubistok, parsley, shnitt-onions and also a melissa are suitable for freezing. If not to use completely thawed spicy greens at once, and to leave for more or less long time, it becomes watery, soft and loses the most part of the aroma. Repeatedly it is impossible to subject to freezing spicy herbs. For this reason it is recommended to freeze pryanoaromatichesky plants always in the small portions, for example in molds for preparation of food ice. Collecting and drying of aromatic herbs by means of vegetable oil it is possible to extract valuable aromatic substances from spicy herbs and thus to keep them. Use such spicy aromatic vegetable oils for grindings and also as seasonings. Fennel, a lavender, a thyme or rosemary excellently are suitable for these purposes. Alya preparations of spicy aromatic oils use high-quality vegetable oils, for example olive. On 1 liter take approximately a greens handful, put it in vegetable oil and insist on light from 2 to 3 weeks. Then liquid is filtered through a small sieve, deleting with that branches of pryanoaromatichesky plants from oil. It is possible to extract from spicy herbs essential oils and aromatic substances also by means of wine vinegar. The tarragon, fennel, a basil, a thyme, a sage and shnitt-onions are suitable for this conservations option. For preparation of aromatic vinegar it is possible to use spicy herbs as separately, and as a part of various mixes. Spicy greens are cut off together with long stalks, washed and well dried. After that it is stacked in glass bottles absolutely dry from within. Then pour wine vinegar. Before to cork bottles, they need to be stirred up slightly to remove the vials of air which settled on spicy greens. 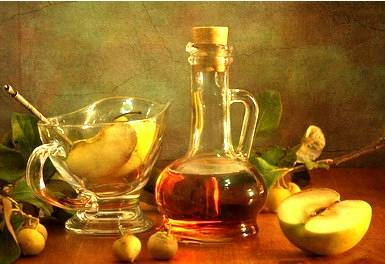 Vinegar within several weeks infuses. It is used for seasoning of salads and preparation of sauces.